Marlborough – The adage “it takes a village” refers to raising and caring for our children. 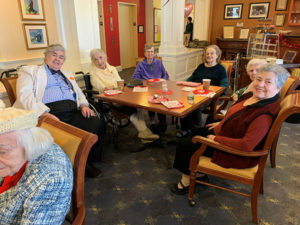 But it also takes a village to care for older adults, many of whom have unique needs and are unable to remain in their private homes as they age. An assisted living community is one option that can meet those needs by providing critical services to residents while fostering independence. For many, however, cost can be a barrier to moving to an assisted living community. Traditionally, residents pay through private savings, long-term care insurance or veterans’ benefits. But Christopher Heights, an assisted living community in Marlborough, offers a unique financial model. When a resident’s funds are nearing depletion, trained staff at Christopher Heights help families to navigate the process of applying for financial assistance with funding from the state. Without the lingering worry about their finances, residents can enjoy a host of amenities while engaging with a built-in community at Christopher Heights, including three chef-prepared meals daily with accommodations made for special diets; light housekeeping; laundry services; and plenty of activities. Residents enjoy each day’s morning gathering, where they can catch up on the news of the day, enjoy a cup of coffee and socialize. Recreational activities are offered daily and can include poker; live entertainment; cultural activities; food shopping and more. Christopher Heights provides transportation for all of its scheduled outings. Nightly happy hours in the pub generate a great sense of connection and energy among residents, as do other evening activities like trivia nights, bingo, spelling bees and nightly fireside chats. Christopher Heights residents make their home in one of 83 private apartments that include studios, one-bedroom and alcove apartments. All have a kitchenette, a walk-in shower with seats; ample handrails for physical support; and pull cords for help. The emergency response system is monitored 24 hours a day. One-bedroom apartments include a bedroom separate from the living space, extra storage space and are located in the facility’s corners, providing a gentle cross breeze. Alcove apartments feature bay windows, allowing plenty of ample natural light. Stephanie Nordstrom, Director of Marketing & Admissions, said that while the model of care at Christopher Heights is non-medical, all staff, including nurses, home health aides and certified nursing assistants, complete regular training on such topics as dementia care, customer service, medication management, first aid, dining support and more. “Our staff really care about our residents. We hear all the time from happy family members who tell us how comforting it is to know that their loved one is thriving, engaged and cared for,” Nordstrom said. Currently, residents are between the ages of 64 to 100. For those lucky enough to celebrate 100 years, Christopher Heights celebrates in style with a celebration and a proclamation from Marlborough’s mayor. In addition to Marlborough, Christopher Heights has facilities in Worcester, Webster, Attleboro, Northampton, and Belchertown. To schedule a free lunch tour at Christopher Heights in Marlborough, call 508-281-8001. The Marlborough location is 99 Pleasant St.